This magnificent Great George was supplied to Charles II in 1661 by the Royal goldsmith, Robert Vyner. It was described as ‘A v. large enamelled George set with 20 large diamonds and one hundred and odd lesser diamonds’. Charles II is depicted wearing it, together with the new coronation regalia, in John Michael Wright’s portrait of c.1670. The Great George was illustrated with Charles II’s other insignia in Ashmole’s History of the Garter, 1672. It has subsequently lost the flowing cloak worn by St George and the large diamond-set fleur-de-lis suspension loop with which it was attached to the collar. Some of the surviving stones are sixteenth century cuts and indicative of the reuse of stones following the Restoration. The oak leaves on the underside are, perhaps, an allusion to the Boscobel Oak in which Charles II hid to escape from Cromwell’s forces after the Battle of Worcester in 1651. The Garter collar follows the style of collars produced after the Restoration. Its construction is significantly different from earlier seventeenth century collars and the finish of the reverse suggests hasty production. Collars made immediately after the Restoration included twenty-six roses and knots and weighed around 30 oz. This collar, with its twenty-one knots and weighing 33 oz 10 dwt, is therefore smaller in terms of knots and garters. The Jewel House began supplying heavier collars with twenty-one roses and knots in 1685 and it is therefore likely that this collar was made shortly after James II’s accession. Both collar and George were taken by James II into exile in France in 1688. They appear as ‘A Collar of the order with a George to it of Diamonds’ valued at 6,000 livres in James II’s posthumous inventory drawn up at Saint-Germain on 20 July 1703. Prince James Edward Stuart is depicted wearing them in Francesco Trevisani’s portrait of c.1719-20. The collar and George were not listed with other pieces bequeathed to the Prince of Wales by Henry Benedict, Cardinal York, in 1807. The Prince asked for their whereabouts to be investigated and in 1811 William Hill took up the task on the advice of General Mackenzie. Hill discovered that the collar and George, which were described as being ‘once in possession of Charles 2d’ had been given (by Cardinal York?) as security for debts. The whereabouts of the pieces was still unresolved at the time of the Congress of Vienna in 1814 and the topic was raised by the Prince Regent with Cardinal Consalvi when the two men met in July of that year. The Cardinal was able to inform the British Foreign Secretary, Lord Castlereagh, of the condition of the items when they met in Vienna in October 1815. Although it is not known when the Prince received the collar and George they were certainly in his possession by 1825 when he wore the George at a Waterloo dinner at Carlton House: ‘He [George IV] ... acquainted his guests that the George which he reserved for his own wearing was the same which had been worn by Charles I, Charles II, and James II and was bequeathed by Henry IX, Cardinal of York to the present king’. 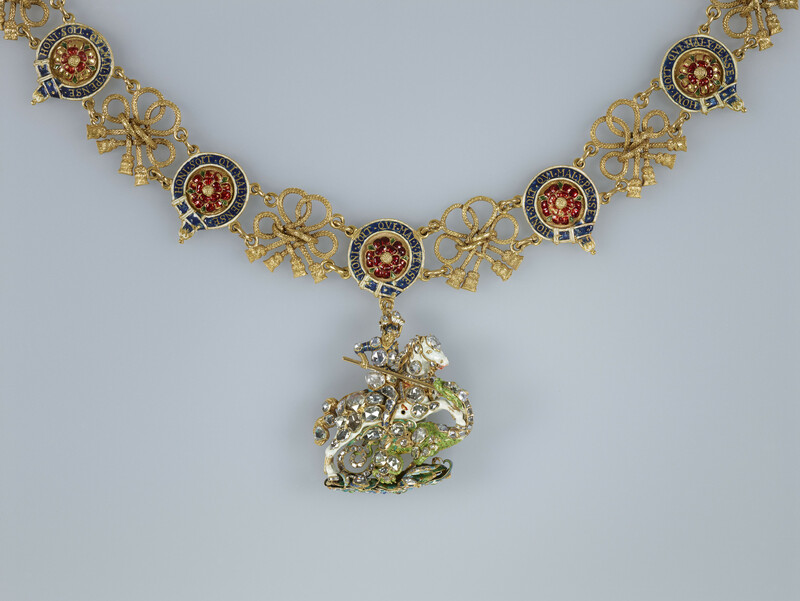 In 1830 the collar and George were deposited on loan by William IV in Edinburgh Castle where they remain on display with the Honours of Scotland.